Public Security Minister Gilad Erdan (Likud), published this morning (Thursday) on his Facebook page a thorough response to charges against him following reports about the police investigation relating to the incident in Umm al-Hiran. At the outset, Erdan made it clear that "police investigators and policemen on the ground indicated unequivocally that it was a terror attack in which one policeman was killed. These were the findings. No one has an alternative source of information besides the police forces on the ground and I, as a minister who is not at the scene of the incident can only rely on the police; this is how it works and must work in any organized framework and between each government agency and the minister appointed over it." 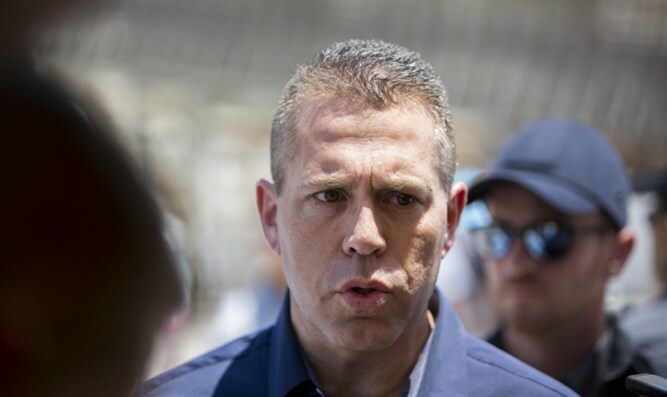 Minister Erdan stressed, "I always stand behind forces sent on a mission; I stood behind the police who acted there in our name, and so long as there is no objective contradictory finding, it is my duty to continue to stand behind those who work night and day to guard us all and to enforce law and order. As we all sleep at night - they go on difficult and risky missions that require split-second decisions. If every time there is a barrage of criticism against the police from the very entity over which they are enforcing - then the forces will not receive the necessary backing, and there will be no police and there will be no law and order. There is no way the police force can function if the position of the lawbreakers is weighed equally with that of the police. I remind those who have forgotten - the police arrived to enforce the evacuation of illegally constructed houses." He said, "As soon as the internal police investigation commenced - I said I would accept its conclusions. Is it possible that errors were made during the difficult and complex incident that happened there? It is possible; certainly, in the midst of a complex situation like the forces on the ground faced. If it turns out that errors were made or that this was not a terrorist attack, then the system definitely has a duty to learn and I will ensure that lessons learned and that which needs to be fixed will be rectified. "However, and this is a crucial caveat - there is no connection between what I wrote above and the forceful and fictitious campaign being waged against me and the police commissioner and the police. The charges against the police as if they deliberately direct violence against Arabs began immediately after the ramming. Arab MKs led by Ayman Odeh, who incited the locals in the months before the incident, produced an extensive public and media campaign the sole purpose of which was to deter the police and me from enforcement against illegal construction. They did not shy away from any inciteful expression against the state and its representatives (their incitement can be found on YouTube). Therefore, friends: It will not help them. I understand exactly what they are trying to do and it will not happen. The law is the law for everybody," stressed the minister. "Despite the wild attacks and slanders, I will continue to enforce law and order in all parts of the country and to promote the coexistence and equality in which I believe. The incident at Umm al-Hiran was a difficult event, whether it was an attack or not. The police conclusions, whatever they will be, we will accept and act accordingly. And if it turns out that it was not a terrorist attack, then certainly we should also apologize to his family," Erdan concluded.